In previous articles we discussed culture and theology independently. This all too often is the way we deal with these two spheres, as if we can somehow exist without cultural influences or apart from the world in which we live. Some of the most vigorous sermons I have heard on the topic have energetically denounced all associations with “culture,” all the while doing so in a state-of-the-art building where we all gathered with culturally influenced clothing, music, and preaching style, and immediately upon dismissal, we all headed to our favorite restaurants—the best our culture has to offer—talking and texting on our cell phones as we went. I am finishing this article with July 4 in view. Americans have been extremely blessed with a culture that affords opportunity, pleasure, and freedom that is unmatched in the world. Though we may have preferences about culture, we do not have the option to reject culture outright. While some may prefer the “good old days,” and often romanticize the past as if it were devoid of culture, it must be remembered that the good old days were themselves filled with culture, and there was a time when the good old days were on the cutting edge of something more primitive. The obvious example is music, something that has been a problem in the church for centuries. Some prefer songs from a previous era—and I must say I too am rather fond of older songs—but when what we call “hymns” first emerged, they were considered to be vulgar by many and inappropriate to be sung in churches. And what is sometimes referred to as “good old Pentecostal music” (which was mostly borrowed from or shared with other denominations) is music that was influenced by honky tonks. Some of the older music emerged from many influences including folk, country, jazz, rhythm and blues, and rockabilly. Any musical style one may prefer has secular antecendents. This is where the battles emerge. We often have preferences about culture, and these preferences frequently are in conflict with others’ preferences. For example, some have complained that the new songs have too many words, but has anyone bothered to count the words in “All in Him,” “Victory Ahead,” “Wonderful Peace,” or “Harvestime”? Further, there is a tendency to ascribe theological and moral value to one’s personal preferences, which elevates the conversation to an entirely different level. To be clear, everything in a given culture is not acceptable for a Christian, and to set some minds at ease, I will say that not all styles of music are appropriate for worship. The point here is that we cannot extract ourselves from our culture(s), and any choices we make will be influenced to one degree or another by culture. But inevitably we are faced with the task of bringing these two—theology and culture—together. Faith frequently intersects culture, and this places demands upon the Christian. We must be diligent at every turn. Theology is our starting point. Theology is the basis upon which everything rests. It is imperative that we have a solid theological foundation from which we minister. Theology is primarily propositional, not methodological (although it can be methodological, as in the case of baptism). Simply put, theology tells us what is true about God, humans, sin, redemption, the created order, and eternity. Theology is universal (the same truth applies to all people in all places at all times); theology transcends patriotism, politics, and economics (supercedes ideals about nationalism, political identity, and secular existence); transcends culture; and transcends methods. For Apostolics, theology is restorationist and primitive. We seek to restore the teachings and experiences of the apostles and the primitive church. Even so, all theology, if it is good theology, has practical implications. Otherwise, theology remains in the realm of philosophy, and this falls short of the intention for God’s revealed truth. Theology must be fleshed out in life and ministry or it becomes irrelevant. This quickly leads us to the issue of methods in ministry. Which methods are appropriate for apostolic ministry in the twenty-first century? Methods are the contextualization of our theology. Methods are the way we live out our theological affirmations in a given place at a given time—in a culture. Methods are not the same as theology although they should be consistent with one’s theology. Methods are the ways we go about achieving theologically defined outcomes. In a word, methods are pragmatic. To say that we do not use methods, but merely rely on the Holy Spirit, is naive at best and dishonest at worst. Obviously we rely on the power of God’s Spirit—this is one of our theological affirmations—but we devise ways in which this can occur in the lives of people on a frequent basis in a given context. The Spirit does not preach, sing, or administrate. Two pastors who are equally spiritual may have drastically different results with regard to church growth. And though there are many reasons for this, one could be the use of different methods. If one’s methods for dealing with people—including training leaders, dealing with conflict, personal interaction with visitors, and care for new converts—are ineffective, he will not grow a church no matter how spiritual he is. Likewise, if one’s methods for handling money are ineffective, he likely will not sustain church growth. If a church planter goes to New York City and tries to relive the days of brush arbors, he likely will fail miserably, not because of his theology or personal spirituality, but because of his methods. Methods are the contextualization of our theology. Methods, therefore, are culturally sensitive. We all have methods, and once we are entrenched in methods, be they the way we take an offering, pray for people to receive the Holy Ghost, or deliver a sermon, over time we can become comfortable with our methods to the point that our methods actually shape our theology, and we begin to make theological affirmations based on methodological preferences. But we must always distinguish between theology and method. 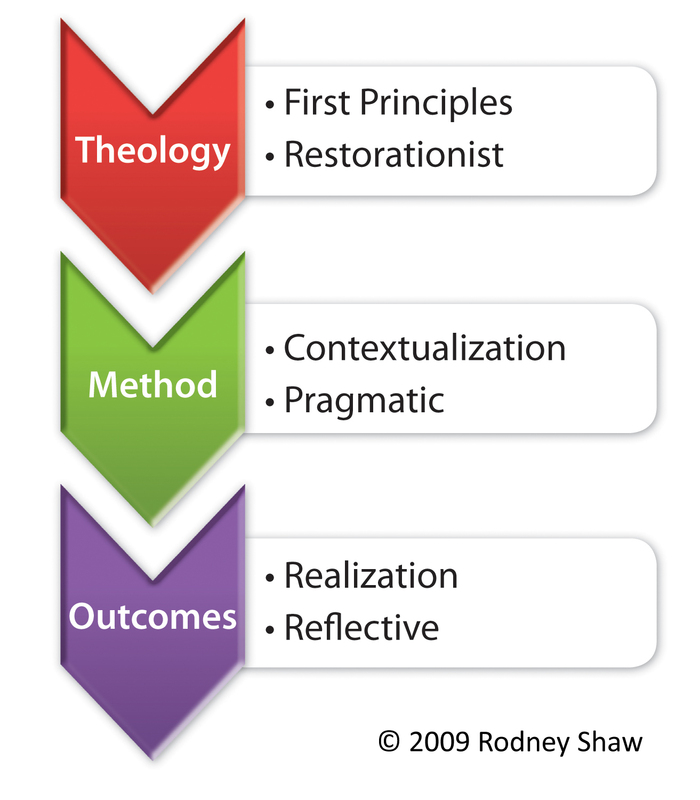 Ideally, ministry occurs in the following sequence: theology shapes methods, which then produce outcomes consistent with one’s theology. In other words, we formulate methods that serve our theology, and hopefully our methods generate the outcomes determined by our theology. Our theology states that all people must be born again of water and Spirit—baptized in Jesus’ name and filled with the Holy Spirit with the initial evidence of speaking with other tongues. This theological affirmation is fleshed out (contextualized) in methods—advertising campaigns, approaches to personal evangelism, music selection, service formats, preaching style, approaches to praying with seekers, children’s ministry programs—with the intent of producing outcomes that are consistent with the theological affirmation, i.e., people should be baptized in Jesus’ name, receive the Holy Spirit evidenced by speaking in tongues, and live a godly life as a result of the methods we choose. It really does not matter whether a minister preaches behind a pulpit in a suit or without a pulpit in a pair of jeans. This is a method. It really does not matter if a preacher moves about the stage yelling into a microphone or whether he speaks in a more conversational tone. This is a method. The more important questions revolve around what the methods are designed to accomplish. Do the methods lead to people being filled with the Holy Spirit with the evidence of speaking with other tongues? Do the methods lead to people being baptized in Jesus’ name? Do the methods lead to people experiencing deliverance? Do the methods lead to people growing in grace and in spiritual disciplines? And further, do the methods hinder people from experiencing these things? Is a sinner more or less likely to receive the Holy Spirit, be baptized in Jesus’ name, and live a holy life as a result of one’s methods? Not only should our chosen methods lead to these desired outcomes (which are theologically defined), the methods should emphasize and prioritize our theology. If the new birth is part of our theological foundation, then our methods should accentuate this, not conceal it. Effective methods do not de-emphasize theological essentials or else the methods are ill-founded and meaningless. So if we claim that the new birth is important, not only will we devise methods that provide opportunities for people to be baptized in Jesus’ name, be filled with the Spirit, and develop Christian disciplines, we will devise methods which accentuate and prioritize this experience and challenge people to seek after it. Outcomes are the tangible results that are produced from our chosen methods. Outcomes—or the lack of outcomes—reflect whether our methods have produced what our theology declares to be important. Outcomes, therefore, are the realization of the effectiveness of our methods. Outcomes do not lie! There is a lot of experimentation with church methods in churches of all stripes. Churches are trying to reach out to people in ways they can understand, and traditional methods are not always the most effective. And though methods are negotiable, one must evaluate his methods by comparing his outcomes with his theology. Let us use the example of our core theological positions as stated above as a case in point. There are several reasons why a church’s outcomes may not be consistent with these doctrinal positions, i.e., people are not receiving the Holy Spirit, being baptized in Jesus’ name, or walking in godliness. We will consider two. The first reason why outcomes are inconsistent with theology is simply due to the fact that one’s methods are ill-conceived to generate such outcomes. One may believe firmly in the theological propositions above and yet never see them realized if his methods are not effective. There could be any number of reasons why methods do not work as we intend. Sometimes we learn by trial and error. Sometimes our methods are antiquated. Sometimes we follow trends that simply do not produce apostolic results. Innovative methods are not necessarily conducive to achieving one’s defined outcomes. When innovation replaces theology as the driving force in formulating methods, the methods very well may not produce outcomes that are consistent with one’s theology. I recall preaching in Yugoslavia several years ago. The churches there did not have “altar calls” during their services. Following I Corinthians 14, they did not want to do things that would be confusing to outsiders and unbelievers, especially with regard to speaking with tongues. Accordingly, they insisted that those who wanted to receive the Holy Spirit must do so in a private prayer meeting, not in the main church services. Theoretically, this method could work. Practically, however, it did not work. The net effect of this method was that people typically did not receive the Holy Spirit. This is an example of how their method betrayed their stated theology. The second reason why one’s outcomes may not be consistent with the theological propositions above is that one simply does not believe these affirmations or does not feel they are a priority. Although one may say he believes in the new birth and a life of godliness, if he devises methods to the contrary, he has either fabricated methods to his own demise or he really does not affirm these theological positions. We must be innovative and make sure we are communicating the gospel with a methodological palette that is comprehensible to those around us, and this may be a different palette from which our forefathers worked. Even so, our theology is non-negotiable. On this we must agree. What is the greatest issue facing the UPCI? Is holiness a doctrinal matter? Do music styles matter? What is your position on facial hair, makeup, and hair length? Do you agree with the Articles of Faith of the UPCI? These and more questions are presented in a survey of 70 questions intended for licensed UPCI ministers. The survey can be taken anonymously. If you are a licensed UPCI minister, please consider taking the survey and passing on this information to your fellow UPCI ministers. I appreciate your keen insight, and I really enjoy your blog.